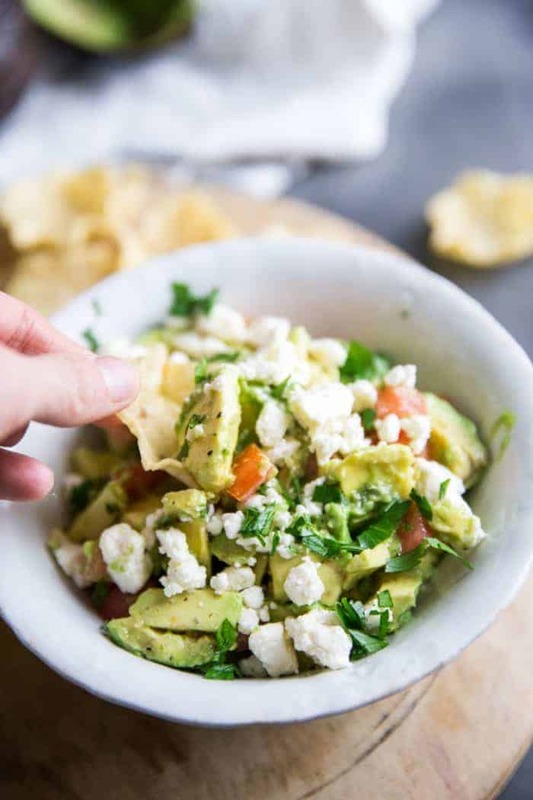 Make an extra batch of this feta avocado salsa because whether you serve it as a side, a topping or a salsa, it is going to disappear! I remember thinking as a kid, that I wish I never had to eat or sleep. It just killed me when I had to stop playing to do something silly like eat! And you know kid time is so much longer than adult time. One night’s sleep took an eternity! Think of all the drama in Barbie’s life I could create if I never had to stop playing!!!! I thought about this the other day when I called my own kids to eat and I was greeted with crickets chirping. No one came. I called again, nothing, zilch, nada. Not even a “be there in a second”. Nope, just an enormous, chasm of silence. My daughter was reading, my son was watching Lego videos and my little one was playing. If I weren’t a mother, all this ignoring would be giving me a complex! But I understood. All three kids were so engrossed in what they were doing and the thought of eating just wasn’t important enough to tear them away. Adults just don’t think this way. We enjoy our food and our meals so much than our pint-sized counterparts. Sometimes where and what we are eating is literally the highlight of our day, especially if we are eating cake or cookies. We have weekly meal plans, weekend dining plans, we have friends over to share a meal. It’s all about food. Of course, being a food blogger, I think about food A LOT! And I don’t know about you, but each night I so look forward to that moment that I fluff out my pillow, turn out the light, snuggle with my dog and smile while I wait for sweet, sweet slumber to take over. I love to sleep. And I can’t wait to sleep in on the weekends! The thing is, as we age, we plan our days around our meals and naps more often. We eat lunch, we nap. We eat dinner, sit to watch tv and fall asleep. The only difference between adults and toddlers when it comes to eating and sleeping is we consistently look forward to these things each day! But I digress. Back to my kids tuning out my dinner bell. 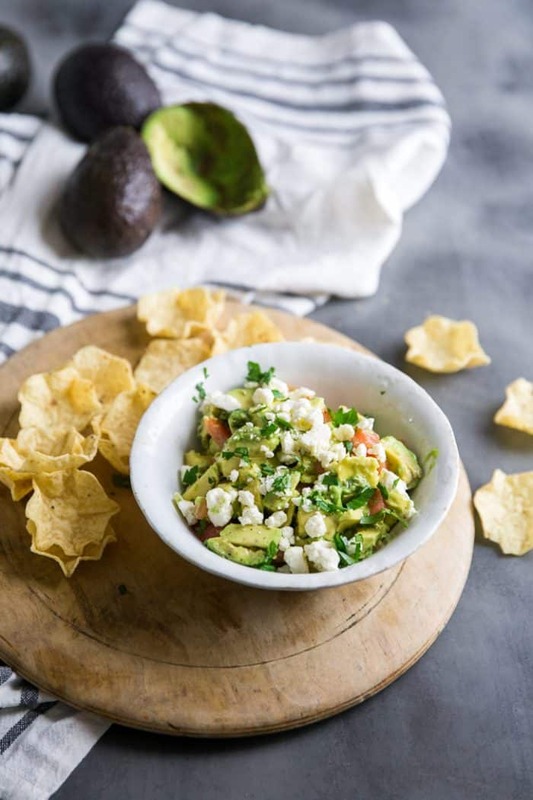 When they did finally come to grace me with their presence, I had this feta avocado salsa waiting for them. Normally, I’d serve this as an appetizer. But tonight we had it on the side because it was so darn tasty! Feta and white wine vinegar are naturals together. The tang from the two is mellowed by the creamy avocados. Oh my gosh, I could eat this every day! I decided that I was going to have it for lunch the next day! See, I planned my day around my food. Why fight it? Love salsa? Try this Watermelon Feta Salsa, or Tomatillo Salsa Verde! In a bowl, combine the olive oil, vinegar, oregano, salt, red pepper. Add garlic, tomatoes, avocados and parsley. Gently stir in the feta. Cover and chill until ready to serve. All of my faves in one bowl…yum! Found you on Your Home Based Mom: Finding the Pretty & Delicious Linky Party! Pinning! Mmm, my favorites too! I was happy to eat this for a snack, I ate it for lunch, and dinner too! Thanks Lori! No cilantro??? Oh the feta made it nice and salty. Loved it! Ha, my kid is never to busy to eat. I’m teaching her early! 🙂 Love this salsa! Ha ha. And I’m too impatient to NOT eat! My kids are weird! This would be one rockin’ dinner! I totally understand when you say sometimes the highlight of the day is what I’m eating. Visiting from Mix it up Monday. Thanks Michelle for understanding how important food is! It’s all I look forward to sometimes! Tanya I saw this linked up somewhere and had to click on it, only to see that it was your recipe! I shoulda known! Dude, I LOVE avocados like SO much and this is just brilliant. I may have to make this this weekend for the Superbowl! And crazy how time crept by so slowly when we were kids and now it just FLIES by!! And I don’t like it one bit lol. Glad I’m not the only one who gets so excited over food. It pretty much is the highlight of my day 🙂 Oh and how was that Strawberry Tomato Salsa? It looks so pretty but I’ve never had strawberries in my salsa. Interesting!!! The strawberry salsa is one of my favorites! I think you would love it Desi!!! You and I have the same tastes! I am crazy for avocados! Thank you! I LOVE this salsa, it’s one of my favorites! I hope you try it! Thank you! Love avocados, so this looks just simply scrumptious! Thanks for sharing. I adore avocados!!! Thanks Rita! Thanks Emily! I love both avocados and feta too! 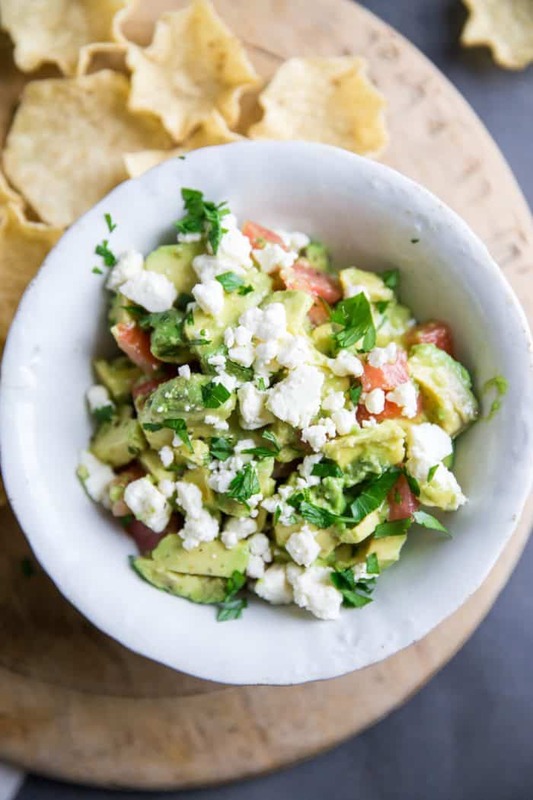 I really adore the combination of creamy avocados and salty feta. You are making me hungry…. Thanks Loretta! It was a good combo. I’m making me hungry! 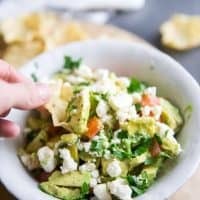 I’ve made a similar salsa, but never throught to add feta! YUM! The feta gives it just the right amount of salt! Nothing better than a chunky salsa! And feta is one of my all-time favorites! I agree, I love chunky salsa! Wow, pretty sure I could eat this everyday too! It looks amazing. I heart avocados 🙂 And I heart sleep, hahaha! I heart sleep too, better rarely get enough! How does this happen? Heck with it, I’ll just eat more! I am always up for a nap or a dinner. Funny how things change as we get older! I absolutely love avocados and could eat them every day. I could eat avocados every day too. Actually, we almost do! We eat a similar salsa at our house…but we use red wine vinegar, cilantro and purple onions. We seriously live off of it in the summer!! I love using red wine vinegar!!! I could live off this too! Ohhhhhh this is soooo goood! I just about ate it all…by myself! Now you have me planning all the times and ways I am going to eat/serve this salsa! Breakfast with eggs. Lunch on a wrap. Dinner as a side with chicken. Did I mention I love this recipe? Thanks! This was the most addicting Salsa ever!!! So good! I am in love with this recipe! 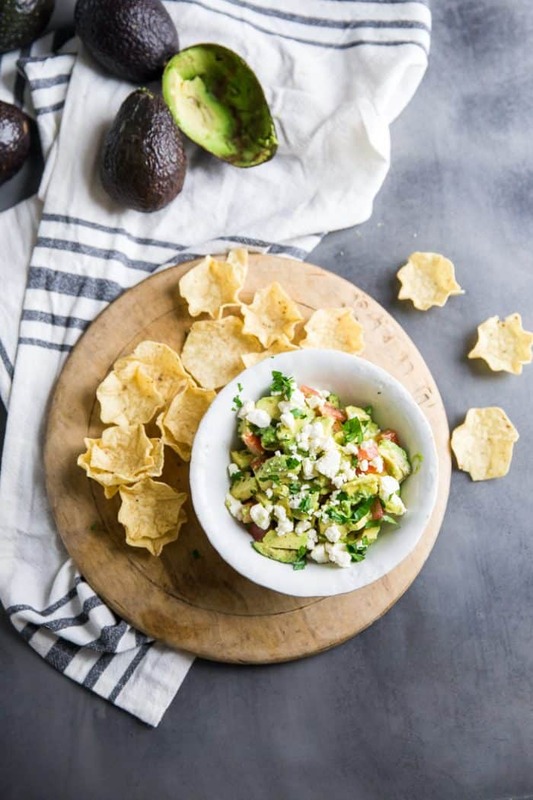 Avocados and feta sound incredible…but I’ve never tried it. Until now!! You wouldn’t think those flavors would go together, but it’s an amazing combo!